Beautifully animated and featuring some stunning sound design work, this is an utterly charming animated adventure that's a treat for both adults and children alike. 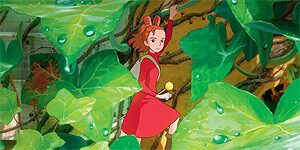 Directed by Hiromasa Yonebayashi and based on Mary Norton's classic children's novel The Borrowers, Arrietty centres on a tiny, spirited young girl (Mirai Shida in the subtitled version, Saoirse Ronan in the UK dubbed version) who lives under the floorboards of a house with her mother Homily (Shinobu Ohtake subbed, Olivia Coleman dubbed) and her father Pod (Tomokazu Miura/Mark Strong). On the day that Arrietty is due to accompany her father on her first ‘borrowing’ mission, a sickly young boy called Sho (Ryunosuke Kamiki/Tom Holland) moves into the house and, much to her horror, spots her as she's taking some tissue paper. Despite her parents' warnings that ‘human beans’ are not to be trusted, Arrietty gradually befriends Sho and the two form a close relationship. However, Arrietty has to be careful not to be seen by either Sho's grumpy cat or interfering housekeeper Haru (Kirin Kiki/Geraldine McEwan), who has her own suspicions about the little people. As you'd expect from a Studio Ghibli production (Spirited Away, Ponyo, Howl's Moving Castle), the animation is both breathtakingly gorgeous and impressively detailed throughout, vividly capturing the world from Arrietty's pint-sized point of view. Indeed, the film proves the perfect marriage of source material and animation style, adding in perfect touches such as Arrietty absent-mindedly bouncing a balled-up woodlouse or racing alongside jumping crickets. The voice work in both versions is excellent (both versions are screening in the UK), with Ronan proving perfect casting in the UK dub. Similarly, the sound design work is genuinely stunning, particularly during a rainstorm sequence and a chaotic scene involving a crow. Yonebayashi orchestrates some utterly delightful set pieces, most notably Arrietty's first borrowing mission, which is staged like a mountaineering expedition (the sight of Pod scaling a table-leg using double-sided sticky tape on his hands and feet is one of several wonderful images). In addition, the central friendship is genuinely touching and the intelligent script works in a subtle message about endangered species and the environment without being overly preachy or sentimental. Beautifully made and genuinely moving, Arrietty is a thoroughly enjoyable animated adventure that's worth seeing in both subtitled and dubbed versions. Highly recommended.